Editor’s note: Fifth grade teacher Denise Anderson was originally slated to contribute this article but died unexpectedly before it was written. She was an enthusiastic participant in the book arts project and would have been proud to see the article and photos published. We would like to thank her colleague for writing this as a tribute to Denise’s passion for immersion education. 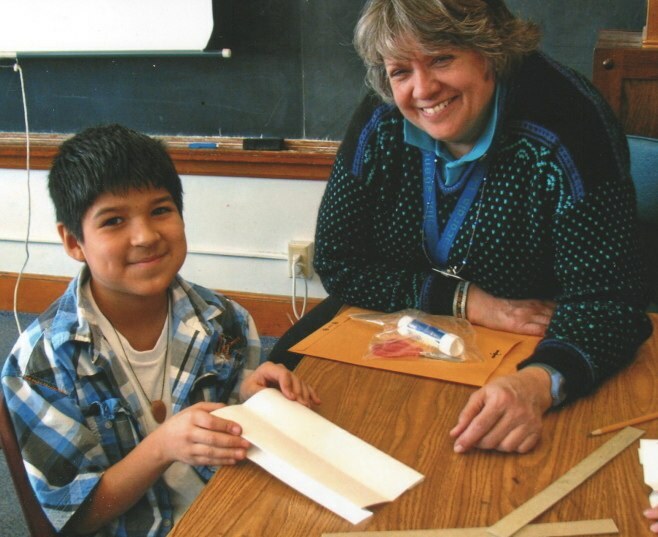 Adams Spanish Immersion is the K-6 component of the K-12 Spanish Immersion Program in the Saint Paul (MN) Public Schools (SPPS). Our mission is to challenge students using language-centered immersion instruction in Spanish to become bilingual, biliterate and bicultural. Fifth grade teacher Denise Anderson readies the necessary supplies for a book project. Adams chose to work with the Minnesota Center for Book Arts (MCBA). Two main reasons determined our choice. First, past partnerships had proved to be very successful and, second, book arts projects lend themselves to the enhancement of language learning. The project was designed for intermediate grades 4, 5 and 6, and involved eleven classes or approximately 250 students. Students in these grades receive approximately 80% of their instruction in Spanish; therefore, our students’ final written work was in Spanish. Students integrated social studies and language arts curriculum with the theme, El Mundo a Nuestro Alrededor (The World Around Us). They researched and wrote about different people and/or cultures and their contributions to our lives. Our MCBA partner, Jill Weese, described how the project would look for each grade level. Each fourth grader would make a hardcover, four-section pop-up book to represent one aspect of culture in Minnesota from four different perspectives: traditional foods of the Hmong, Native Americans, Swedish Americans and Somalis. 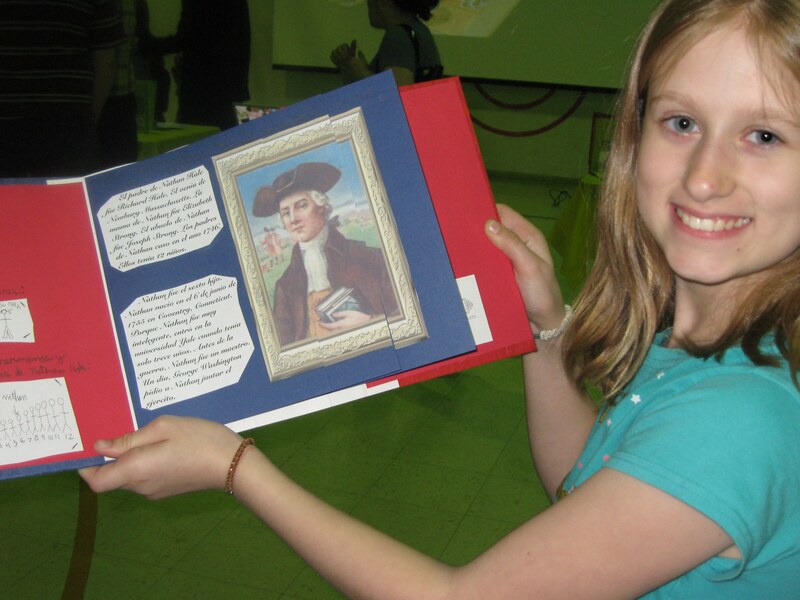 Each fifth grader would make a hardcover, accordion flag book with full pages and a picture of a prominent figure from the revolutionary period of American history. Each sixth grader would make a hardcover, landscape pop-up book. The book format was the graphic novel and had three landscape sections. Its theme was world history focusing specifically on Ancient Greece. Each grade level had paper choices to reflect the themes of their books. A rubric (see Table 1) was developed before the writing and book projects were begun and then shared with students. Their final book projects were assessed using the appropriate standards that were embedded in the rubric. Standard benchmarks were addressed and met in three areas: arts standards, language standards and social studies standards. Arts standards developed students’ technical skills, which enabled students to plan and implement a creative, new vehicle for their written work. Using three-dimensional media, students discovered different forms for presentation and exhibition. Moreover, through the integration of language arts and social studies standards students developed research, organization, writing, and reading comprehension skills. To insure students met the criteria on the rubric, school staff and our arts partner collaborated in the assessment process. According to the rubric’s objectives, students’ work was evaluated on eight criteria according to four levels as exceptional, proficient, developing and beginning—levels that also correlate with the district’s Summary Reports. 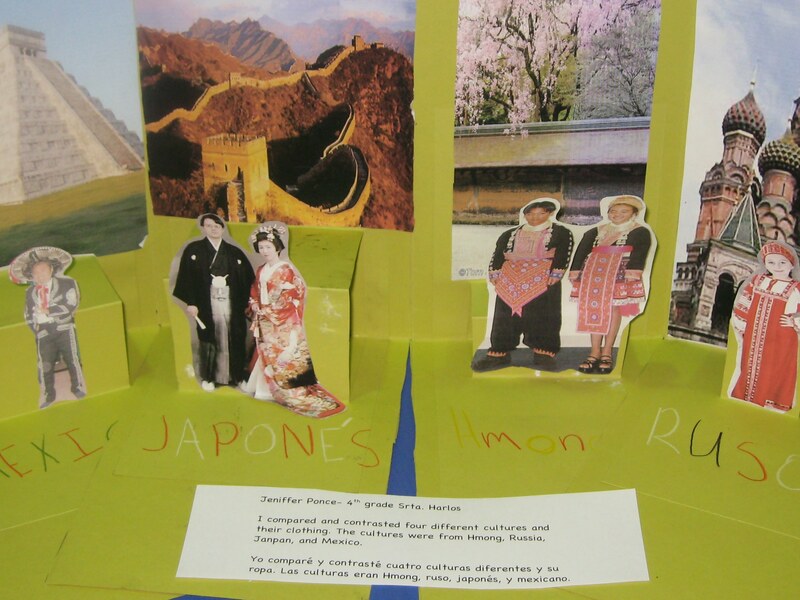 Fourth graders created pop-up books to make cultural comparisons among local ethnic groups. The rubric was designed by the sixth grade team (Jane Davis Berg, Raul Arroyo and Aurora Ortiz) for their students’ projects. Points were awarded as follows: 1 point each for criteria at the “Developing” level and up to 4 points each for criteria at the “Exceptional” Level. The highest score of 32 total points earned a rating of “Exceptional;”scores between 24-31 points qualified as “Proficient;” scores between 16-23 points were rated as “Developing;” and, the “Beginning” level was assigned to any project earning fewer than 16 points. The column on the far right highlights the standard being evaluated. A fifth grader shows off her book on American history. Teacher collaboration was evidenced in creating and implementing grade level rubrics as well as participating in staff development training provided by the Minnesota Center for Book Arts. Collaboration with an arts organization was invaluable. The skills of their craft that the artists brought were evidenced by what they shared with students and staff. The final products students completed were unique with a certain distinct quality only possible when working with a professional. We look forward to more collaborative projects in the future that integrate core curriculum while enhancing language learning.